Space saving tray for self serve facilities. These trapezoid trays offer seven deep compartments for ample, portion controlled servings. Serve soup and salad at the same time! Made out of Camwear Polycarbonate, virtually unbreakable! 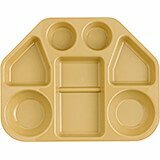 14" x 17-15/16" x 1-1/2"
Space saving tray for self serve correctional facility feeding. Offers seven deep compartments for ample, portion controlled servings. Serve soup and salad at the same time.